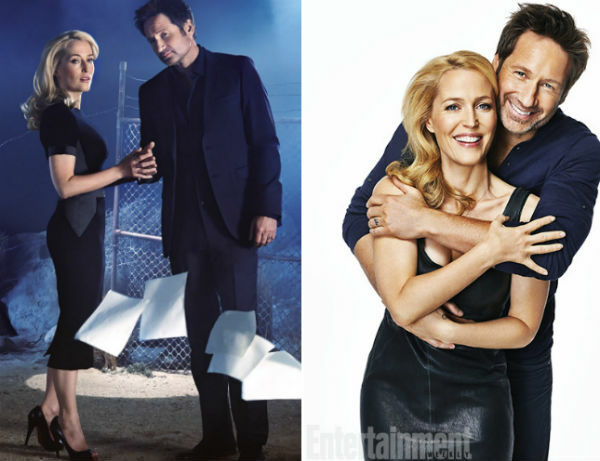 David Duchovny and Gillian Anderson in Entertainment Weekly’s reunion issue. -Speaking of EW’s reunion issue, this video of the cast of Mystic Pizza is classic. I love the look on everyone else’s faces when Julia Roberts says she’s the most “innately happy” of all of them. -In other EW reunion news, Amy Poehler and Adam Scott interviewed Robert Wagner and Stefanie Powers for the online edition. –Ryan Murphy has confirmed that Glee will end next season, and the reworked series finale will ‘honour’ Finn. -Glee’s Chris Colfer just scored a massive book deal that will see him publish two more ‘Land of Stories’ novels and a picture book. –Kate Moss (who’s now the fashion editor at British Vogue. No, really) has a modeling contract that stipulates she gets a cigarette break every 15 minutes. –Michael Bay was attacked by two brothers on the Hong Kong set of his new movie. The director said one of the guys attacked him with an air conditioner, and that “it was like a Zombie in Brad Pitt’s movie World War Z — he lifted seven guys up and tried to bite them.” Luckily, the police arrived before the air conditioner transformed. –Mischa Barton has opened up to People about her “full-on breakdown” in 2009. -Meanwhile, this photo is supposed to prove how buff RPattz is getting. I don’t see it. -Goddamit, Jake Gyllenhaal can even make a man bun work! -Speaking of stupid styles, the biggest trend I saw in Europe was women wearing tights or pantyhose with Nikes (always Nikes, never another brand – and always super functional ones). My eye grapes still haven’t recovered. -Also, all over Denmark there are really creepy billboards featuring Christopher Walken as part of this bizarre fashion campaign. –Blake Lively will play an ageless lady in The Age of Adaline. -Here’s the red band trailer for That Awkward Moment. Shirtless Michael B. Jordan! –Macklemore prank called a Craigslist scalper about Macklemore concert tickets. -Remember that Vanity Fair story that Gwyneth Paltrow tried to squash? It’s so on! –Kim Kardashian and Kanye West have taken their sexting public. Bully for us. -In “You’re Super Old” news, Eminem turns 41 today. -Britney Spears wants James Franco to play Christian Grey in Fifty Shades. Blech! -Elle is getting loads of backlash for their decision to wrap Melissa McCarthy in a big coat for their cover. I’m just pleasantly surprised they even put her on the cover. -It looks like Miley Cyrus will be playing a naked silver alien in Future’s new ‘Real and True’ music video. -Here’s a photo that fans of Buffy, Game of Thrones, Sherlock and Neil Gaiman will love. -The Bad Lip Reading guys have topped themselves with this Game of Thrones clip. –Jessica Simpson and her fiancé are in Capri, where they’re reportedly getting ready to get hitched. -Justin Bieber covers Metallica. Sadness ensues. -Meanwhile, Selena Gomez cried in concert while performing a song about The Biebs. -The trailer for Wes Anderson’s The Grand Budapest Hotel, starring Ralph Fiennes, is so very Wes Anderson-y. I mean that in the best possible way.